Having a drink in the Philippines always goes hand in hand with the taking of pulutan, the term for Filipino bar food. Simple pulutan include a wide range of dishes from grilled sweet potato (kamote-cue) to fried tofu (tokwa) to these easy-to-eat adobo nuts. If the salty tang of these finger-licking snacks isn’t enough to tempt you, the added layer of sweet will ensure that they won’t last long in your kitchen. They are wonderful as a snack, an appetizer, or as a garnish for salads. 2. 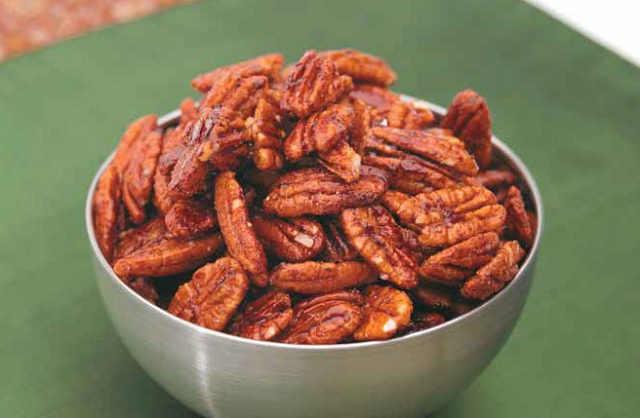 Combine all the ingredients in a large bowl and mix until the pecans are well coated. Pour the nuts onto a parchment-lined or lightly oiled baking sheet, separating the nuts as much as possible into a single layer. 3. Bake for 15 minutes until the nuts are golden brown. 4. Cool the nuts before handling, 10 to 15 minutes. They will be crispy with a brown shiny glaze. 5. Store in your cupboard in an airtight container for up to 2 weeks.